Though largely led by low cap stocks as highest percentage gainers, the week ended Friday January 19, 2018 saw the Nigerian bourse growing consistently, for the third straight week in 2018. So far in the year, it has been a 17.91% growth. 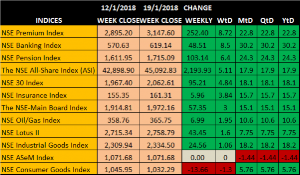 As expected, the week had opened low Monday January 15, 2018 at 42, 898.9, touched a low of 42, 262.8 before embarking on a recovery trip that extended beyond Monday and stretched through Wednesday with the index touching 44,901.00. There was a marginal decline Thursday while the bull returned Friday to close the week at 45,092.83. Just as in the previous weeks, low cap stocks led in the bull apparently for varied factors. While some price performances of low cap stocks are late market responses to good earnings, others sure have the smart money running in them for reasons beyond the books. At the end of the week under review, Skye Bank plc led with a price of 53.57% as the price moved from 84 kobo at the start of the week to close at N1.29. The stock closed Friday with excess bid size which suggests a strong open Monday. Technical tools are indicating overbought levels which is a warning to be wary of fresh investment but then, this warning had been so for previous twelve sessions and more within which the stock price keeps bouncing. Unity, Wema and Diamond are other major gainers in the week with price growth above 40%. Significantly, aside from CCNN and perhaps FBNH that has just recently climbed high above the N10 mark, the first sixteen major gainers sell below N10. This is a clear indication of where the market tilts. Investors are sure looking for bargain in stocks where capital appreciation could stretch to the high heavens. At the end of the week, Forty (40) equities appreciated in price. On the losers side were thirty two equities led by National Salt with a decline of 13.64% to close at N19 from an open of N22. Last week was the first of such for the stock in 2018 as the first two weeks ended in the green for the stock. Technically, a few more days of decline makes it buyable. Current P.E ratio below 10 makes the stock attractive. Significantly, Honeywell which was the highest price percentage gainer in the previous week lost 10.23% to close at N3.16. Eterna with a loss of 8.48% was tenth on the losers’ table for the week. Price performances that are not backed by deals, volume and value could be best described as fluke. In the week under review, Guaranty stood out in value with well over N6.5billion investment. The forces behind its price performance is sure not weak as its price in the same week gained 5% to close at an historical price of N54.71 and yet not looking tired. FBNH and Access were other major value makers for the week. 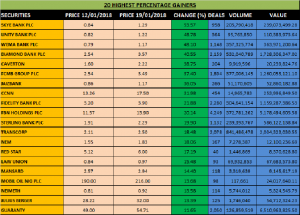 Transcorp, Diamond and FCMB, all low cap stocks led the market in volume for the week. The accounted for 10.96% of the total volume recorded in the market for the week. The three equities also featured on the highest percentage gainers’ chart for the week. First four days of last week saw FBNH’s price in the green thus leading to September 2015 level before bargain hunters rushed in to take profit Friday, leading to a decline of 5.8%. On the whole, the week was the third straight posit9ve performance for the institution since the beginning of 2018. MtD, it has been a price growth of 58%. For 2017, FBNH returned a total of 162.69% to its investors. Trading in FBNH however closed Friday with well over 1.667 million units on offer. This suggests a weak open Monday though anything is possible within the week. At current price of N13.90, the company’s P.E Ratio based on its 2017 Q3 earnings of N1.28 is 10.38. This suggests that its 2017 Q4 earnings would have to come solid and strong to justify current price. Earlier in 2017, it reported the sum of 44 kobo as Q1 and 88 kobo as Q2 earnings. For the year end December 2016, a 20 kobo cash dividend was paid out from a full year earnings of 42kobo. This is expected to inch up significantly as its 2017 full year results are being expected in the market. It suffices to state that loan loss provision and challenges of settling NNPC funds in the kitty of its bank component will remain the major determinant in the expected account to watch out for. NSE premium index was best in the week under review. This apparently due to the WoW performances of Dangote Cement which grew by 8.3%, Zenith with 5.6% growth and FBNH with 20.4% growth . NSE consumer good index was the least performer with a negative return in the week. Traded during the week were a total of 1.947 million units of Exchange Traded Products (ETPs) valued at N105.567 million executed in 15 deals, compared with a total of 777,535 units valued at N7.689 million that was transacted last week in 15 deals. Goldlink Insurance Plc’ proposed AGM, formerly slated for January 25 has been postponed. A new date will be announced later. FCMB: Mr oladipo Jadesinmi and Mrs Olapeju Sofowora were appointed Executive Directors in the group. STANBIC IBTC: A meeting of the Board of Directors of Stanbic IBTC Holdings PLC (the Company) is scheduled to hold on Thursday 01 February 2018 at 10:00am. The meeting will discuss amongst other items, the Company’s Consolidated and Separate Audited Financial Statements for the period ended 31 December 2017 as well as a Dividend Proposal. PHARMA DEKO: The Board of Directors is scheduled to meet on January 26, 2018 to discuss dividend payout among other issues. JULIUS BERGER: The Board Audit Committee of Julius Berger Nigeria Plc would meet on Thursday January 25, 2018 to consider the results for the Fourth Quarter ended December 31, 2017. In the light of the above, January 12, 2018 to January 25, 2018 has been declared a closed period (“the Closed Period”).